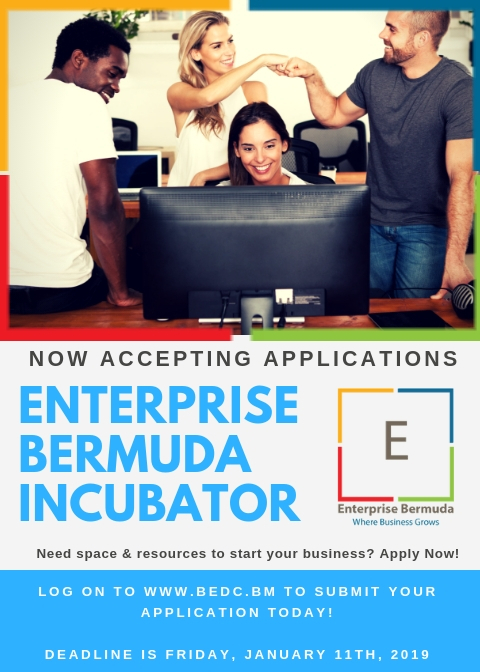 The Bermuda Economic Development Corporation (BEDC) is now accepting applications for the second cohort of the Enterprise Bermuda Incubator (EBI) starting on January 28th, 2019. This is an opportunity for entrepreneur’s and start-up businesses to apply for space, the help of advisors and resources within BEDC to help start up and solidify their new business. Applicants must complete this application in its entirety to be considered for acceptance as a participant in the Incubator by BEDC. All applicants will be interviewed by the BEDC Incubator Committee and given an opportunity to discuss their business further. Acceptance and participation are afforded at the sole and absolute discretion of BEDC. Applicants are mandated to participate in programs designed to increase their chances for success. This includes meeting monthly with their BEDC officer and attending entrepreneurial events and training workshops. The EBI should be accessible to all startup and current businesses requesting assistance. The mission of the EBI is to support entrepreneurs who demonstrate the greatest chance for business success, growth and adding jobs to the community. Applicants will be accepted on a yearly (12 month) basis and must demonstrate adequate progress in order to retain their space in the incubator. Please fill out the following application if you are interested in learning more about membership in EBI. All fields marked with an asterisk are required. Adhering to policies & procedures of the program and facility. 1. Why you want to join the Enterprise Incubator 2. Why you think your business will be successful 3. Any other information you think will be beneficial or noteworthy to know about you/your business. You can upload your video to YouTube and send us the private link here. Disclaimer: This information will only be used for interviewing purposes and if not successful will be deleted. If selected, you agree to allow use of your video and or photos as it relates to the promotion of the Enterprise Incubator.